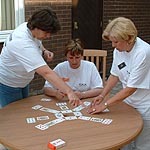 Ice Breakers for Training, Meetings, Events & Corporate Activities! 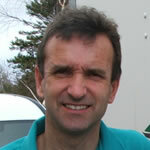 “Hi, my name is Phil England. I have worked in the events and training industry for over 25 years now and I've built up a fair amount of knowledge and expertise along the way. One massive thing I've learnt is - what makes people tick - and in my business, Eventus, we have used icebreakers to successfully kick-start all manner of training days and events, team building meetings, away days and conferences for our corporate clients - some of the biggest names in the industry "
Why use an ice breaker anyway? makes people laugh and raises levels of endorphins. My ebook on corporate icebreakers is my ultimate collection. Over 50 of my favourite icebreakers have been selected from over 25 years experience of running corporate team building events, training and experiences. I have included my all time favourites and sorted the best from the rest. There's plenty of choice, excellent ideas to make your event turbo-charged. I want you to be able to emulate my success, and here I share with you the best icebreaker ideas and games I know. Electrify your events and corporate meetings with our best ever collection of over 50 incredible icebreaker games and ideas. Used the world over for training, away days, team meetings, conferences, fun days and team building. 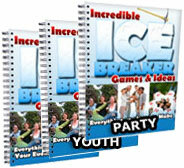 or for a limited time you can order the entire collection of icebreakers for all occasions at an amazing price!